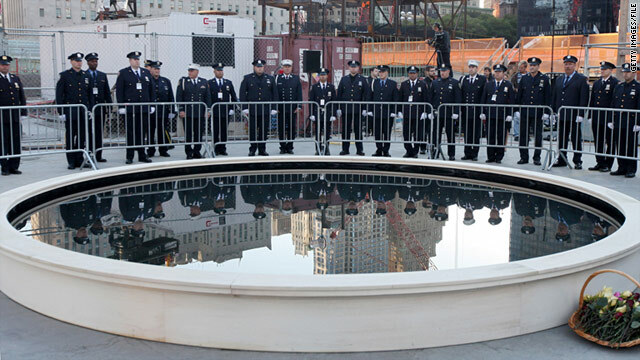 New York City police officers attend last year's September 11 memorial ceremony. First responders are not invited this year. New York (CNN) -- When debris rained from the sky in lower Manhattan on September 11, 2001, the first responders to the terrorist attack did not turn away. They rushed to the World Trade Center buildings while the world around them crumbled. Yet now, after all the wreckage has been cleared and the rebuilding has begun, their path is again blocked -- not by flying chunks of smoldering rubble, but by space constraints. The first responders are not invited to this year's September 11 memorial ceremony at ground zero, New York City Mayor Michael Bloomberg's office confirmed Monday. It's a painful insult for many of the approximately 3,000 men and women who risked their lives, limbs and lungs on that monumental day, puncturing another hole in a still searing wound. In a statement, Bloomberg spokesman Andrew Brent said the commemoration ceremony is for the victims' families. "While we are again focused on accommodating victims' family members, given the space constraints, we're working to find ways to recognize and honor first responders, and other groups, at different places and times," Brent said. But first responder John Feal, founder of an advocacy group for the police officers, firefighters, civilian volunteers and others who worked at ground zero, assailed Brent's response, saying Bloomberg "lives in his own world." "The best of the best that this country offered 10 years ago are being neglected and denied their rightful place," Feal said. Denise Villamia, a first responder who worked at ground zero for several months, cried over the phone as she recalled her "totally heartbroken" reaction to the news that she could not attend the memorial service. "I'm crying because it's really a big betrayal on the part of the city, to rob me from my way to pay homage and to find that comfort and healing," she said. "I feel that I have been robbed of my way to pay tribute." In addition to the victims' families, several politicians, including two presidents, are expected to be in attendance. Bloomberg's office would not provide specifics on the ceremony's arrangements, but did note that the first responders have not been invited to the preceding nine memorial services, either. Yet first responder Morris Faitelewicz, vice president of the Auxiliary Police Supervisors Benevolent Association, called that explanation "nonsense." Faitelewicz said that, while there are not usually formal invitations, first responders have been able to attend all of the previous ceremonies simply by showing up. Additionally, many of the first responders see the decision, first reported by the New York Daily News, as evidence of the city's attempt to push to the background their untreated ailments in the official narrative of recovery and renewal. If the responders attend the memorial service, "the promise 'we'll never forget' becomes a blatantly obvious lie -- a public display that the government didn't do right by us," says Bonnie Giebfried, a first responder. "It'll bring up the issue that we're basically walking dead, and that we're not being treated." Despite the passage in December of the $4.2 billion Zagroda Act, which provides medical treatment and compensation to responders, many first responders told CNN that the government has failed to address their health needs. Giebfried has suffered from a failing liver and kidneys, a crushed arm, elbow and wrist; post-traumatic stress disorder, chronic fatigue, encroaching lupus and other diseases. All were caused by the dust, debris and other substances to which she was exposed on 9/11, she said. On that day, Giebfried, an emergency medical technician at the time, was twice entombed in sheared building fragments, and twice escaped. She and her partner, Jennifer Beckham, transported people to safety and set up makeshift triage stations. She watched bodies hit the ground and explode "like a bouncing ball," and suffered three asthma attacks through a harrowing day of devastation. Giebfried said her ongoing medical travails have disabused her of the belief that the United States honors and looks after its service members. Being excluded from the memorial proceedings was yet another confirmation of this, she said. "If the Founding Fathers ever saw what had happened to us responders, they would roll over in their graves," she said. "Leaving first responders and survivors out of the 10th anniversary is absolutely ludicrous." Her frustrations were echoed by others. Father Stephen Petrovich, who drove to ground zero from Huron, Ohio, hours after the terrorists struck, spent weeks at the site removing and blessing the remains of shattered bodies. While there, he says, he inhaled carcinogens that damaged his lungs, and is now in hospice care. "I don't think they want us there because of all the problems we've had," Petrovich said. "It's like we've been dropped off the face of the earth." In July, the World Trade Center Health Program, which administers funds from the Zagroda Act, ruled that first responders would not receive compensation for cancer treatment because there is no established causal link between the incidence of cancer and exposure to the site on September 11, citing a dearth of "published scientific and medical findings." A first responder who also spent months at ground zero, the Rev. Terry Lee called not being invited back for the ceremony "a rip in the heart." Lee said the country should honor those who responded at its most dire hour of need to encourage others to respond to crises. "I believe attending will help the healing process ... if we go; we can tell our fellow man to get involved, because, 'hey, America takes care of its own.'"